There are several reasons you might consider downsizing to a new home in St. Louis. Perhaps your children have flown the nest, or you just need to reduce the number of stairs you must climb. Maybe you’ve just decided that less is more, and you want to focus on experiences over possessions. Whatever your reason, there are several things to consider when you’re decreasing your square footage. First, consider your lifestyle needs. Will you spend a lot of time at home working on your hobbies? Will your grandchildren visit often? Or is home more of a place to rest your head between adventures? Since your lifestyle needs are uniquely your own, how you choose to downsize, and the new home you choose, should fit those unique needs. Downsizing doesn’t have to mean moving to a cookie-cutter ranch. Perhaps you’re downsizing from a 5-bedroom two-story house. A 3-bedroom 1.5-story with room upstairs for a hobby room, office, or grandkids might be the best fit for your lifestyle. Next, plan ahead and set goals. If you’d like to downsize within the next year or two, start planning now. 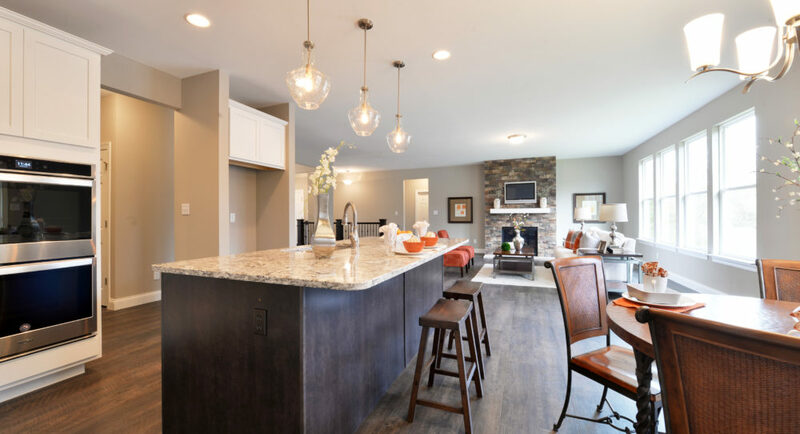 Look at what’s available in the market, check out the websites and model homes of new home builders like Rolwes Company. Determine your desired location and type of home. Does a ranch-style suit your needs best? Or would a 1.5 story be a better option? Do you need a finished lower level for a man-cave, media room, craft room, etc.? Do you need a big yard for dogs, or do you hate lawn maintenance? If cooking really isn’t your thing, then a giant kitchen with a six-burner cooktop probably doesn’t need to be on your list. But if baking is your first love, then those double ovens and a large island for cooling cookies should make your list. Make your new home fit your needs, not the reverse. Set monthly goals, both in decision-making and in paring down your possessions. Even before you’ve decided where and when you’ll move to your new home in St. Louis, you can start to downsize your possessions. Consider quality over quantity, and keep only the best items. Track usage of your items. One option is to put items in question into a box marked with a one-month or six-month date. If you haven’t gone searching for the item in that timeframe, then it’s not terribly necessary to your lifestyle. Purge things a few items at a time, such as books and clothing. Gather all like items together; keep your favorites and sell or donate the rest. Revisit the items again in a few months, and you might find yourself letting go of a few more items in the second round. Whether or not you subscribe to the KonMari Method that every possession should “spark joy”, you can certainly begin to eliminate items that don’t serve your current lifestyle or that you’re holding on to out of a misplaced sense of guilty sentimentality. If having your grandfather’s old tools or your aunt’s antique sewing machine truly makes you happy, then certainly hang on to it. But if you’re keeping an item only out of guilt, take a photo and let it move on to someone who will truly love and enjoy it. Or consider repurposing the item to fit your lifestyle. Can your grandmother’s tiny dresser serve as a unique nightstand or end table? Measure all your items and keep track, whether you create a spreadsheet, make a note on your phone, or just keep a written list. If your giant dining table doesn’t make sense for your new life, consider a smaller one with leaves for the occasions you do entertain a large group. Find a function for each corner, shelf, and cabinet in your new home in St. Louis. Can the bakers rack you love hold items in your new entry or become a bookshelf in the great room? Consider digitizing all your old photos and displaying them on an electronic frame rather than stashing them away. Take photos of sentimental items that don’t really fit your life, and keep them in a keepsake book (deleted comma) along with photos of your old home that can be used to spark memories. Most importantly, use the things you love. Rather than keeping your best china stashed away, move it into the kitchen and use it. Read your books instead of using them as decorating props. Put that tackle to use and go fishing. Find joy in your new home that perfectly fits your lifestyle.